At Creative Diagnostics, we offer robust and flexible manufacturing options. Whether you are a new start-up company looking for someone to manufacture your assay, or a fast growing company under pressure to meet increasing demand, our manufacturing service will deliver the results you need to fulfill your customers’ expectations. 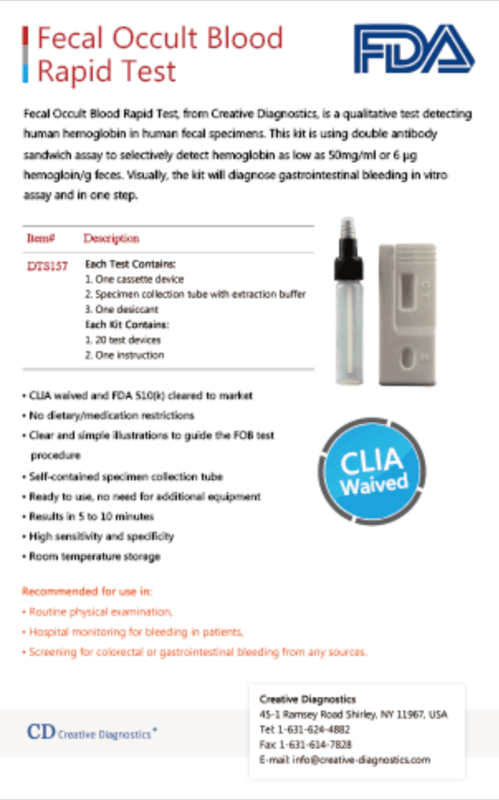 This information sheet gives an introduction to FOB Test which is FDA approved test. 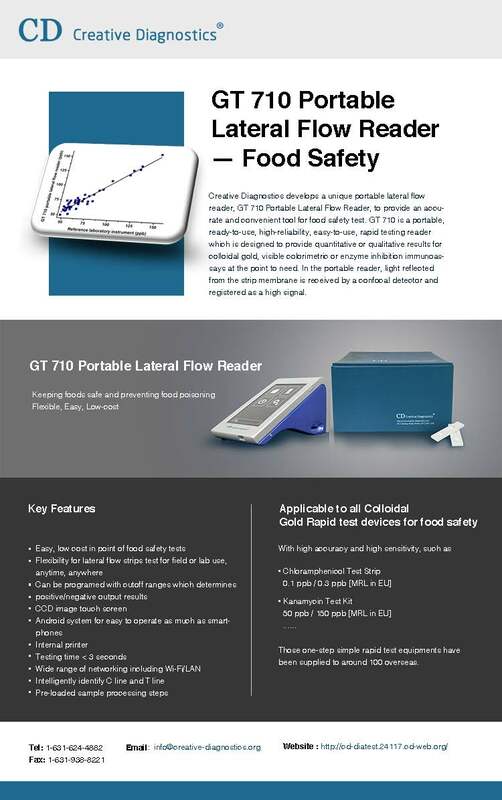 Creative Diagnostics develops GT710 Portable Lateral Flow Reader to provide an accurate and convenient tool for food safety test. GT 710 is a portable, ready-to-use, high-reliability, easy-to-use, rapid testing reader which is designed to provide quantitative or qualitative results. But above all, the device can contribute to improvement of the detection sensitivity of colloidal gold lateral flow strips for food safety tests. Creative Diagnostics ® fluorescent immunoassay analyzer FIA7100 is intended to be used with immunofluorescent strips to provide quantitative results for fluorescent lateral flow tests. 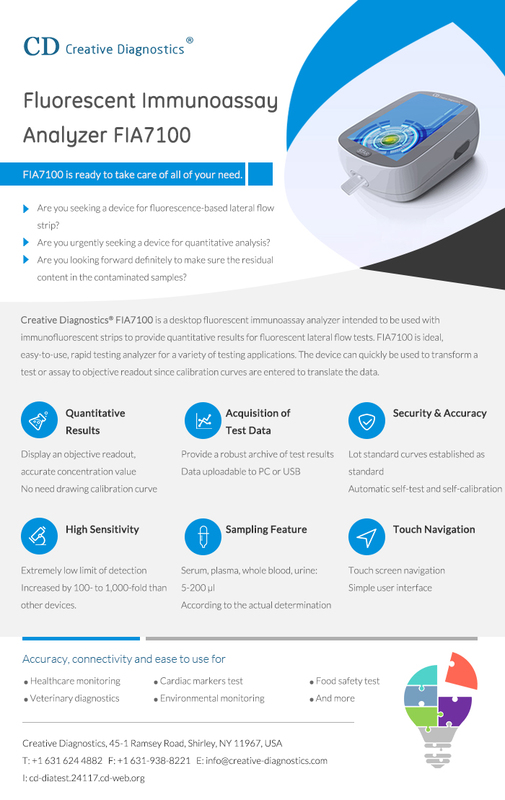 FIA7100 is ideal, easy-to-use, rapid testing analyzer for healthcare monitoring, cardiac markers test, food safety test, veterinary diagnostics, environmental monitoring and more. The device can quickly be used to transform a test or assay to objective readout. Creative Diagnostics ® offers FDA Approved Multi-Drugs of Abuse Urine Tests. These drug tests are urine drug screening kits that test anywhere from 2 to 14 drugs per test. The multi-drugs urine tests are so easy, reliable and accurate for drug screening on site or home drug test.